CANADA - Spring and everyone is seemingly an optimist. 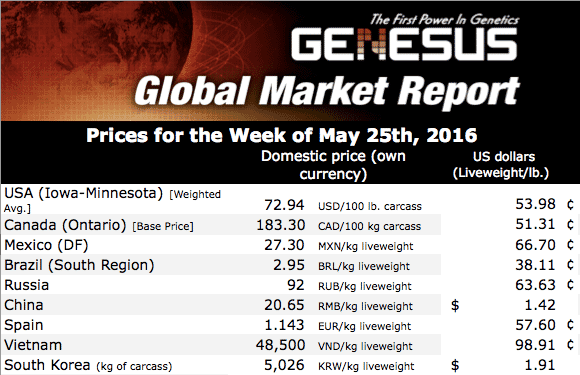 Such is the nature of the season and here in Ontario (Canada) there is much for the swine producer to be upbeat about, writes Bob Fraser – Sales & Service, Genesus Ontario. The crop (95% of Ontario pork producers are land based) has gone in about as smoothly and as timely as could be wished for. For most the corn is in and in many instances well up. Similarly for soybeans with a few wrapping them up, with others focused on finishing off edible beans. There has been little delay or disruption from rainfall although moisture (for now) remains adequate. The start was cool but the last ten days have brought plenty of heat such that the crop to begin with would have to be viewed as excellent by most all observers. This has hence resulted in at least steady grain prices and would appear to bode well for feed prices for the coming year. As you can see from the chart below hog prices have advanced nicely in the last five weeks consistent to the seasonal pattern, improving some $28.00. As feed prices have been relatively stable the bulk of this increase has gone to the bottom line. More importantly everyone in Ontario is now finding a readily available market for their slaughter hogs after the challenges and frustrations of Olymel (Quebec) last fall. Between the start of the seasonal shortening of hog supply and the increase discussed in previous commentaries of SEWs and feeder pigs to the US Midwest, Ontario appears to have found a far better balance. 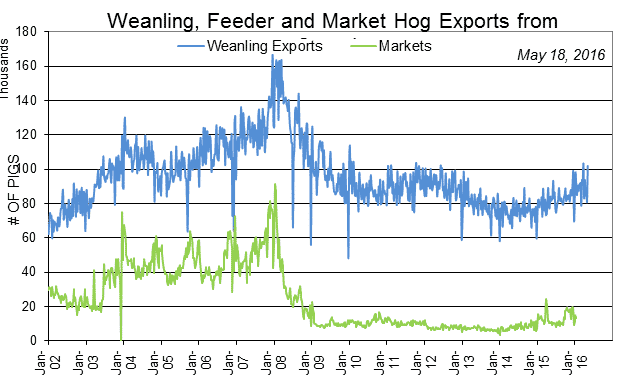 Three weeks ago exports of SEWs and feeder pigs surged to over 100,000 head and although perhaps a one-week aberration this is the first time in a quite a long time. See graph below courtesy of Phoenix Agri-Tech for perspective. So as suggested in previous commentary we’re “back to the future” as in the start of the millennium as a “sow state” to the US Midwest. With an approximate 75-cent dollar this makes us all smarter and works well enough. However should our dollar advance back to par our weak packing industry and in Ontario at least lack of adequate shackle space will come back into view. But for now hope does spring eternal, particularly with a great Spring. Lets see what the summer brings.